In one of my past articles I explained how to trap concurrency violations in entity framework. That article used database first approach for the example discussed therein. Since code first is becoming more and more popular it is worthwhile to see how concurrency violations can be trapped in code first approach. This article explains just that. When you update an entity and call SaveChanges() to save the values back in the database, the existing values for that record are overwritten by the new entity values. This is the default behavior in entity framework code first. In a real world situation it is quite possible that database values might have got changed after you select them for modification. In such cases, your update operation might be overwriting changes made by someone else. This is concurrency violation. And it is important to detect if concurrency violation has occurred. You can then take some corrective action or at least inform the user about such a violation. The former approach is used in cases where your table doesn't have any timestamp or rowversion column. You are required to decorate all the non-primary key properties of an entity with [ConcurrencyCheck] attribute. 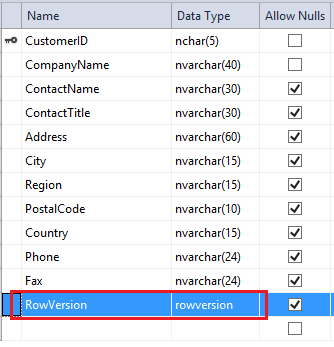 Entity framework then adds all these columns to the WHERE clause of the resultant SQL statement. This way you check whether all the column values that you fetched and the values in the database are same or not. If they are same that indicates no one else modified that record and your UPDATE / DELETE succeeds. On the other hand if the values don't match it's an indicator that someone else has modified the values and your UPDATE / DELETE statement fails. Whenever an UPDATE or DELETE affects zero records, entity framework throws concurrency violation related exception (for example, DbUpdateConcurrencyException). You need to catch this exception and inform the user accordingly (or take a corrective action within your code). The later approach is suitable when you have (or can add) timestamp or rowversion column in your table. In this case you decorate only the timestamp / rowversion property with the [Timestamp] attribute. Just like [ConcurrencyCheck] entity framework then adds WHERE clause for this property. The advantage here is that you have only one column in the WHERE clause (in addition to the primary key) instead of many as in the case of [ConcurrencyCheck] attribute. Note that SQL server timestamp / rowversion gets translated as a byte in .NET code. Let's try to illustrate this with a simple example. We will use the Customers table of Northwind database for our example. Now, add NuGet package for Entity Framework using the Manage NuGet packages option. Our example needs EntityFramework.dll and EntityFramework.SqlServer.dll assemblies that get added by the NuGet package. Notice that all the other properties except CustomerID are decorated with [ConcurrencyCheck] attribute. The NorthwindDbContext class inherits from DbContext class. The constructer of the NorthwindDbContext calls the base class constructor and passes the Northwind connection string name (see web.config markup shown earlier). It also declares the Customers DbSet. The first Index() action simply fetches a Customer whose CustomerID is ALFKI. This is done purely for the sake of testing. 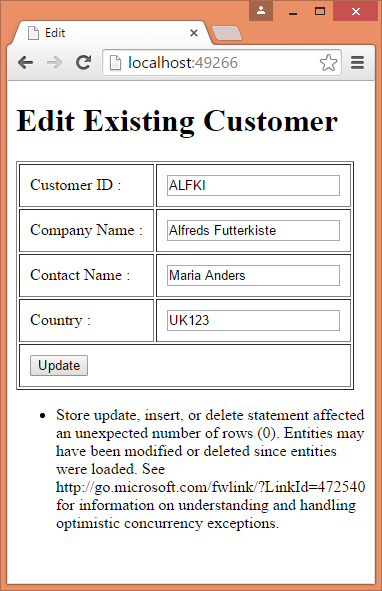 You can use some other CustomerID or even make a provision to select from a dropdown list. The fetched Customer is passed to the Index view as its mode. The second Index() action is intended to handle POST requests and accepts Customer as its parameter. 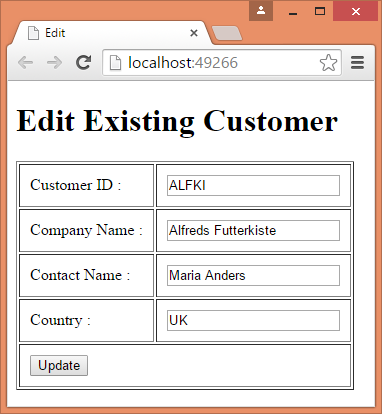 This parameter will be supplied by the model binding framework of ASP.NET MVC. Inside, we simply mark the entity State as Modified and call SaveChanges(). A try-catch block deals with exceptions thrown during the save operation (if any). Ok. Now you are ready to test your application. Set a breakpoint in the try block and run the application. When the Index view is displayed in the browser modify some value (say Country) and hit Update button. As you can see, now you have RowVersion property of type byte and it is decorated with [Timestamp] attribute. Remember to remove the [ConcurrencyCheck] attributes from the previous example. Now run the application again and test it as before. You should get the same exception as before.